Taken from the French word “sertir” which means “to set” in the context of jewelry making, when Rolex uses the term “Serti” dial, they are often referring to any of their gem-encrusted dials across several collections, whether it’s the Datejust, President, Pearlmaster, or others. 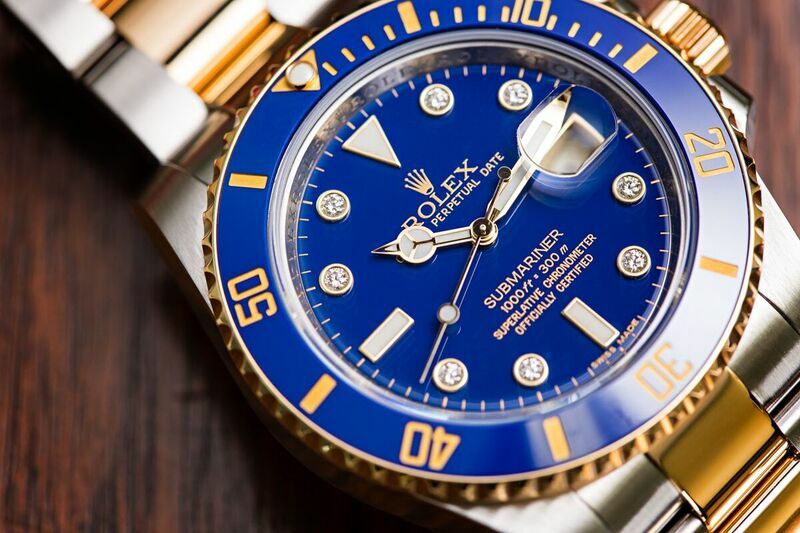 However, when used among Rolex collectors and aficionados, the label Serti is normally reserved for the very distinct gem decorated dials of the Submariner and the GMT-Master II watches. Distinguished by eight diamond hour markers in combination with three indexes in either sapphire for Submariners models or ruby for GMT-Master IIs, the Serti dial ups the ante on the already luxurious Rolex sports watches. Diamonds, sapphires, and rubies on a Submariner or GMT-Master II heightens the luxury appeal of the two tool watches and is an interesting combination that’s worth another look. First appearing in the early 1980s on the full 18k yellow gold Submariner 16808, the Rolex Serti dial is no longer in production for the Submariner. 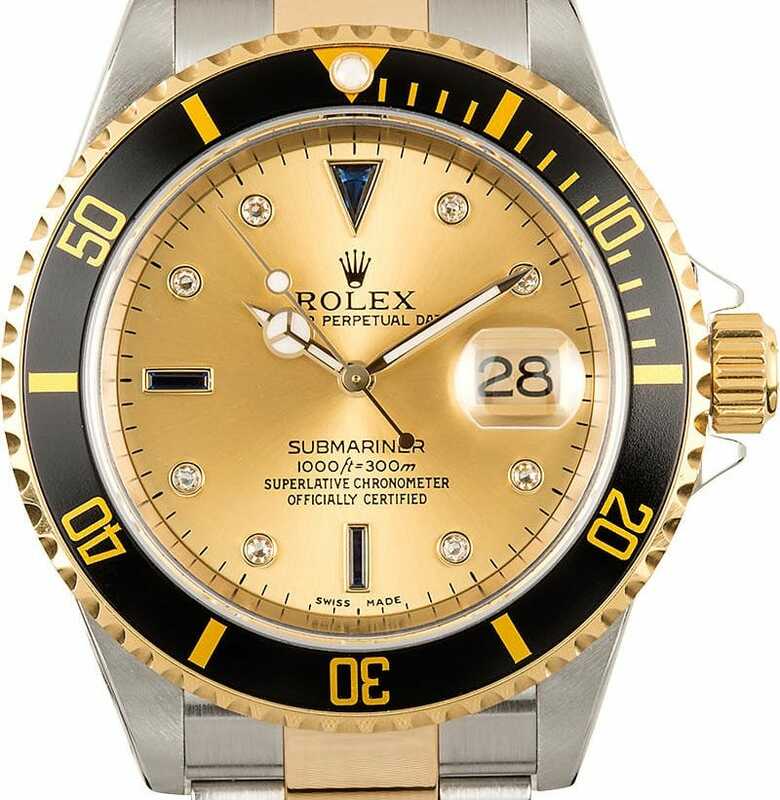 It was eventually replaced with a diamond-only dial version (with some referring to it as the new Serti style dial) on the Submariner 116613 in 2009. That particular diamond-only dial for the Sub 116613 was discontinued in 2012. 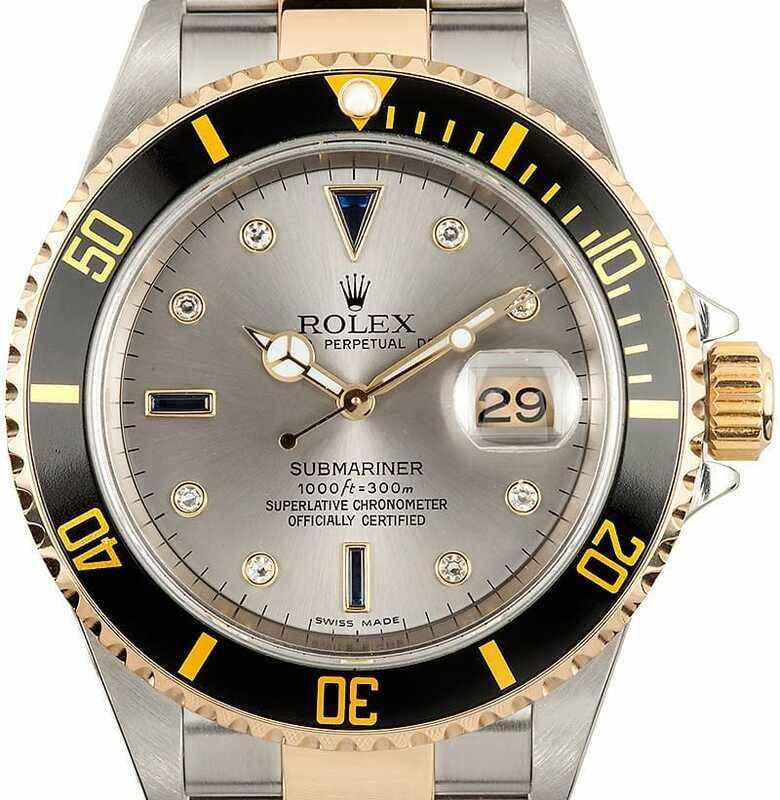 The most famous Rolex Submariners that sported a Serti dial was the Sub ref. 11613. 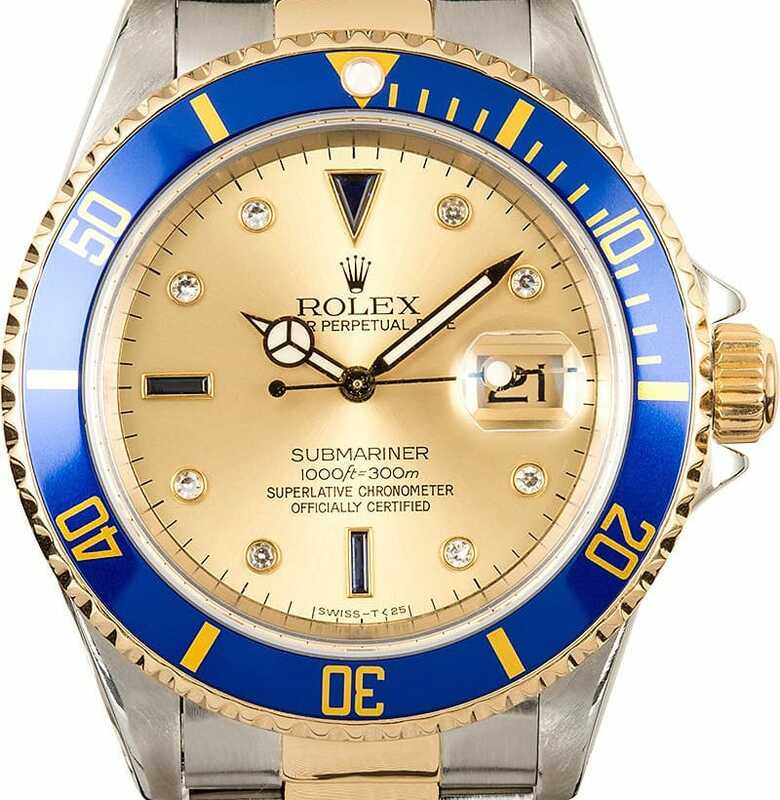 The two-tone steel and yellow gold Submariner was made available with a choice of a blue or black bezel and Serti dial options included champagne or silver. 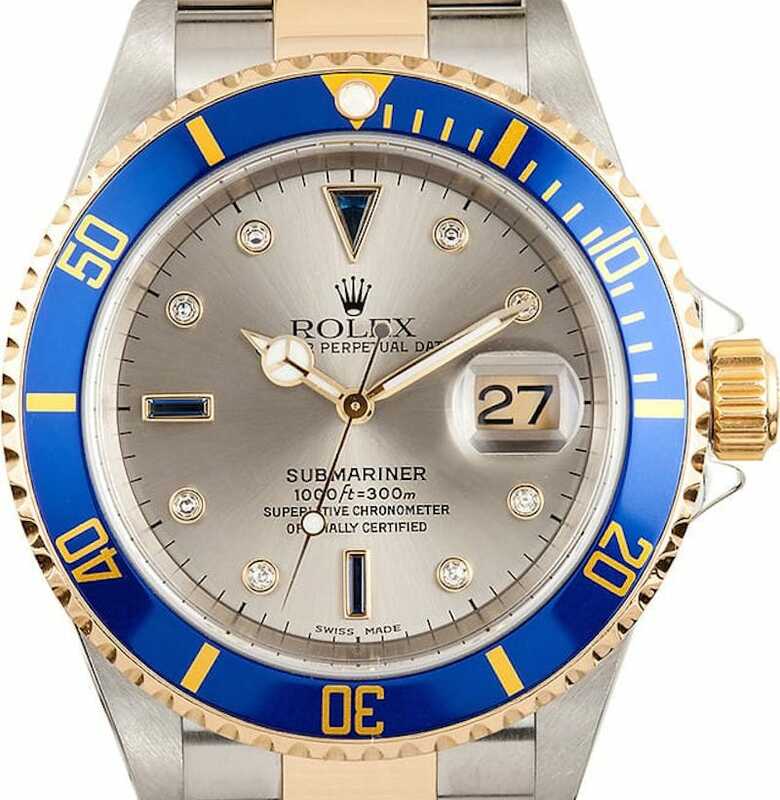 Where the luminous indexes would normally be on a non-gem Submariner, are now eight round diamonds coupled with three sapphires at the 6, 9, and 12 o’clock markers. When the Submariner ref. 116613 with diamonds was released in 2009, the three sapphire indexes were replaced with the luminescent trio the baton markers and the upside-down triangle. This time, the diamond dials were offered on either a blue or black dial to match their new blue or black Cerachrom ceramic bezels. 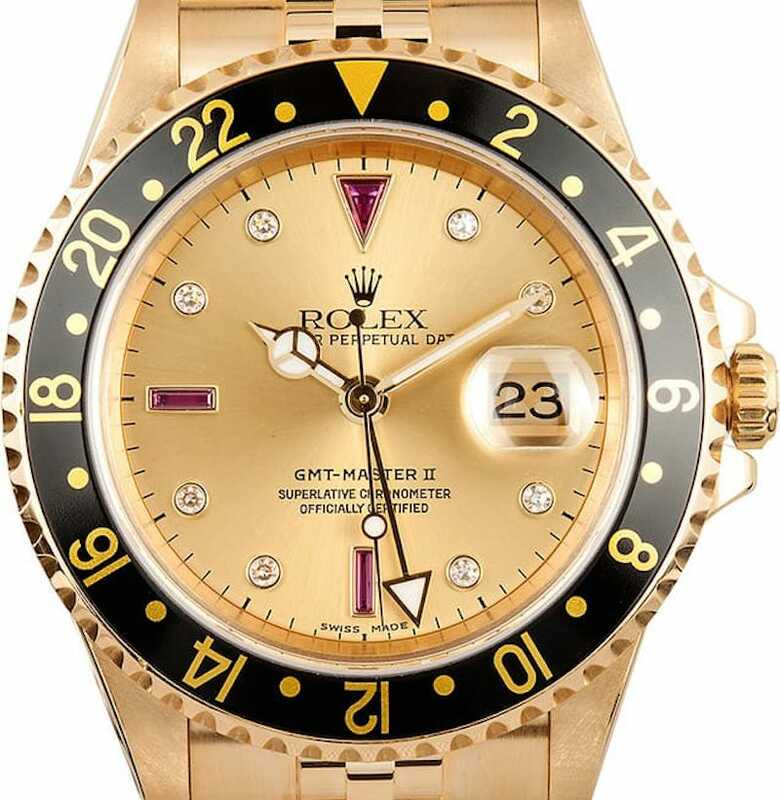 GMT-Master II models with Serti dials are found on the full 18k yellow gold ref. 16718 or the two-tone steel and yellow gold GMT-Master II ref. 16713. The GMT-Master II Serti dials are adorned with rubies, rather than the Submariner’s sapphires, along with the characteristic eight diamonds. Colors of the GMT-Master II Serti dials also include silver and champagne. The Serti dials have been seen in combination with both the all-black, as well as, the Root Beer bezels of the GMT-Master II Rolexes. Certainly not the typical face of either the Rolex Submariner or GMT-Master II, the Serti dial offers something a little different for those who appreciate their unique style and luxurious appeal of serti dials.